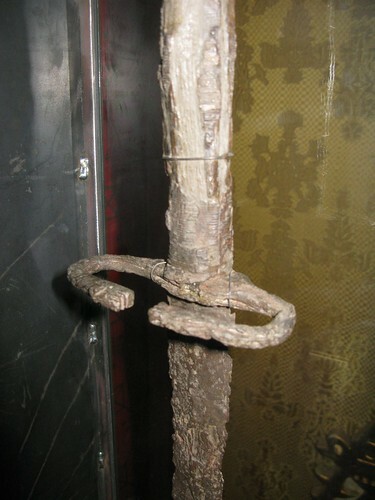 I'm interested in the late medieval Northern European longswords with very long grips (The sword of Svante Nilsson Sture is the example most of us know). 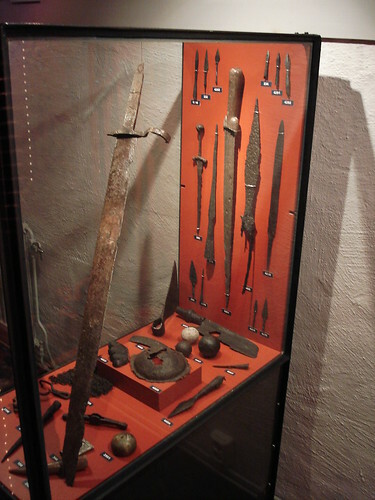 Judging from some of the swords shown in Middelalderens Tveaeggede Svaerd, it seems that there was significant variety in these swords--blade, cross and pommel. The example below is cited as ca.1450 (I would have guessed closer to 1500, but some of the chronology may have been revised since publication 50 years ago). I have only the poor image to judge proportion, unfortunately (I've never seen the text). I've been planning to make one of these using a broad Type XVIII, but I just acquired a longer pseudo-XIX in trade and thought it might work for this project--lengthening the grip by taking the ricasso, making an octagonal re-curved cross and adding a large globular pommel. Hilt furniture blackened. Short tubular chappe. Another version below, with an even longer grip, is more in line with the proportions of the Bruhn-Hoffmeyer example. The pommel size here is very rough. It's meant to be 1.75" on a blade of roughly the same width. My first design below is ~45" overall, with a blade of ~33". Is the narrow fuller and diamond-section lower half out of the question for the period and culture, or was there enough variety, historically, to justify my design? I have no idea of the length or blade section of the Bruhn-Hoffmeyer example. If any of you know that, I'd love to have that info. Better photos of similar swords would be very helpful, too! Those of you who are more familiar with these swords, please tell me what you'd change about my designs. Tear them apart, please! I can take it! I notice that Albion's "Brescia Spadona" has a narrow fuller in its upper half and is of similar length. That's based on a German blade of ca. 1450, so maybe mine will be appropriate for the project. Thoughts? I really like the idea of your project. Blade size of these swords do vary a lot. Some are single hand blade lengths with very long grips. Looks odd, but the do exist. Some are big monster swords with blades of one meter or more. Tang is often close to a third of total length, so the proportions of your sword seems right. The blades vary a lot as well. They come in tow basic guises. They either have a ricasso and then look like the Dane I designed for Albion. Or they have no ricasso and have blades of lenticular or hexagonal section. Some are type XXII, some are a version of type XVII, but wider at the base, thinner in section and more taper to the point: hexagonal cross section. Some are lenticular and are versions of XIIa or XIIIa. You do get blades of some kind of XVIa type as well. It is common to see the point being a small spade shaped affair, or even cut angular almost like the point of a roman sword some times. The guard of the Svante is not a typical guard for these swords (I think his sword comes from south/central europe, possibly from the armouries controlled by Maximilian I). Either they have a very wide slightly curving guard, often with curled ends (backwards towards the grip, instead of in the direction of the curve towards the point). They can have pretzel shaped guards and then almost always type XXII blades. Another very typical and I think rather local guard has both arms curved towards the front of the blade: a C if you look from the pommel down to the blade. Looks odd and rather ugly, but it is very typical for late 15th/early 16th C Sweden. The sword you chose from Ada B Hoffmeier is of that variety: C shaped guard. 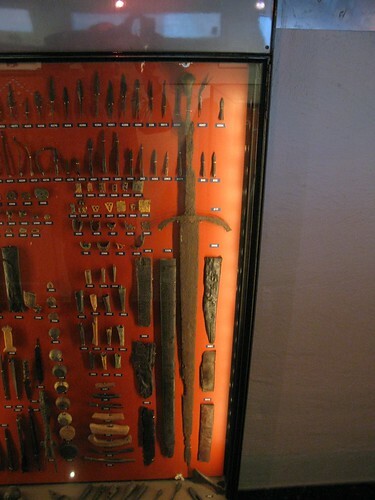 I´d say you can make a nice long gripped scandinavian sword if you go along with your plan. Just shift the guard. The pommel is often spherical or a small scent stopper. Spherical can mean round in face view but octagonal if seen from the rivet, Door knob shaped with incised lines, or a door knob pommel with three pilgrim shells in low relief. This is a feature for the first quarter of the 16th C (I think). The grips are often wire bound in repeating sections along the grip. Use 0.8 mm iron wire: not twisted. Cross section of the grip can be rounded rectangular, hexagonal or oval. Rather substantial grips are common. Yes, and the pommel is rarely a real sphere. It is often a bit flattened. More like a mandarin. 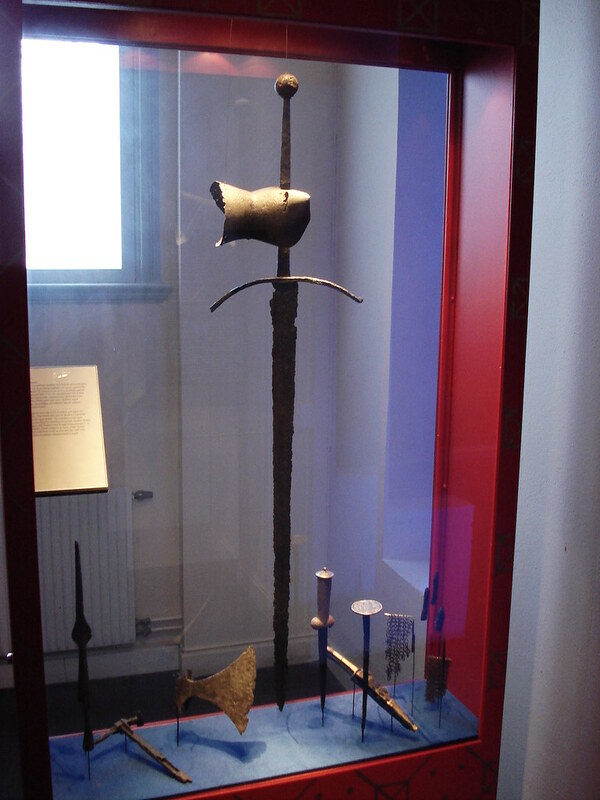 A blade like the Brescia spadona could be used on one of these swords. Yes. Only most that I´ve seen have been bit more sturdy. But in principle, yes. But the one you have looks just about perfect, I should say. Just remove any trace of ricasso and you are fine. The first one is displayed in Skara on Västergötlands museum. I would guess it is about 120 cm long. I haven't seen the second one irl and I don't know if it's on display anywhere. Many thanks, Peter! That's extremely helpful. I did wonder about the Svante's cross--beautiful but unique. I'll need to think about that a bit more. If it was a common type or if I could find a clear image from the period I wouldn't mind using it but I try to avoid using designs unique to a given reproduction. This is all just fantasy at the moment, as I don't yet have the blade in hand. Or the pommel. Or the cross. I'll try it all in clay when I get the blade and see what might work. Here are som other examples from SHM in Stockholm. I have some more pictures somwhere but for some reason there was an error while trying to attatch the files. Can upload them tomorrow if there's interest. Here´s one example of that C-shaped guard type. A bit ornate, that is not usually the case. Most are ribbon shaped. 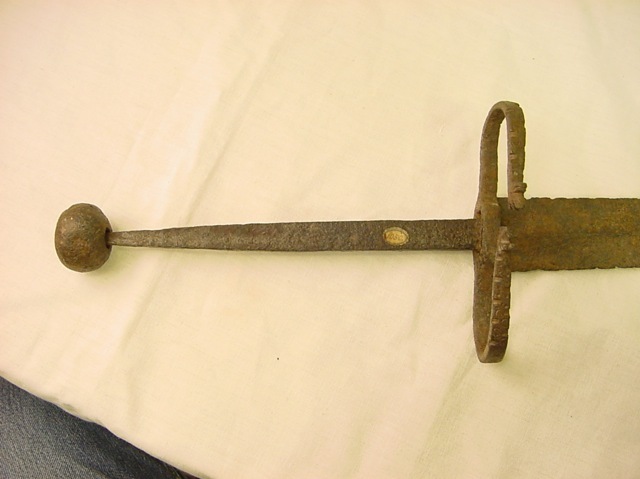 The pommel is fairly typical in shape. Not quite a sphere. This one has a blade of type XVIIIa. I really like these swords. Insanely long grips but very nice handling characteristics. And quite impressive too. There is one very like this one in Lund. I only have the written article about that sword, not any first hand documentation. I do think that sword has parts of the grip preserved with some kind of wire binding. 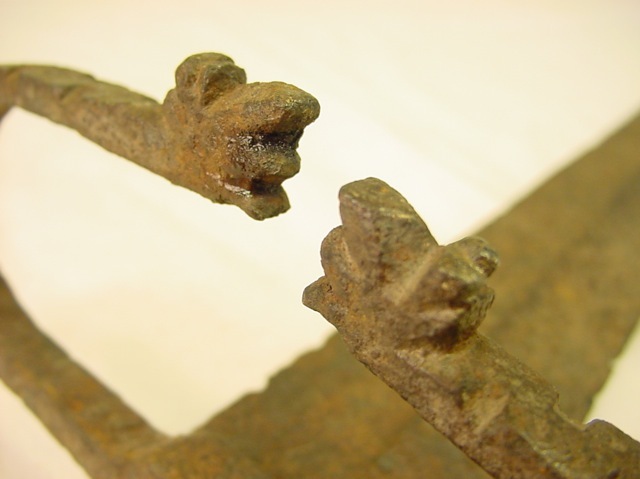 The C-shaped guard on the Lund sword also has small dragon heads (and possibly also the same kind of decorative notches). And a spherical pommel. The blade has (silver?) inlayed markings from Passau and is of type XVIIIa. Perhaps these two swords are sisters? It is a popular type, that is for sure. Quite a few survives, showing many variations to the theme in both details, blade type, proportions and size. Thanks for the additional photos, Eric. Peter, those photos are fantastic! You're very generous with your research. I hate to mine it so deeply, but there just isn't much information about these swords in English. I very much want to make one of these "C" guards. Might have to stretch myself a bit, because I doubt I'll find an existing cross long enough. Might have to make one from bar stock. Oh, well, the challenge is part of the fun! Here is a drawing by the german soldier Paul Dolnstein, who fought Swedish levy soldiers in the early years of the 16th C.
The smart looking and fashionable guy with the halberd is of course a german mercenary. Sean: I got a feeling that the blade might have been perhaps 8-10 cm longer. The tip is quite rounded and damaged, and my first thought when I saw it was that it has lost some length. Wow- that short blade/long handled piece on the right is really, really amazing. How unique! 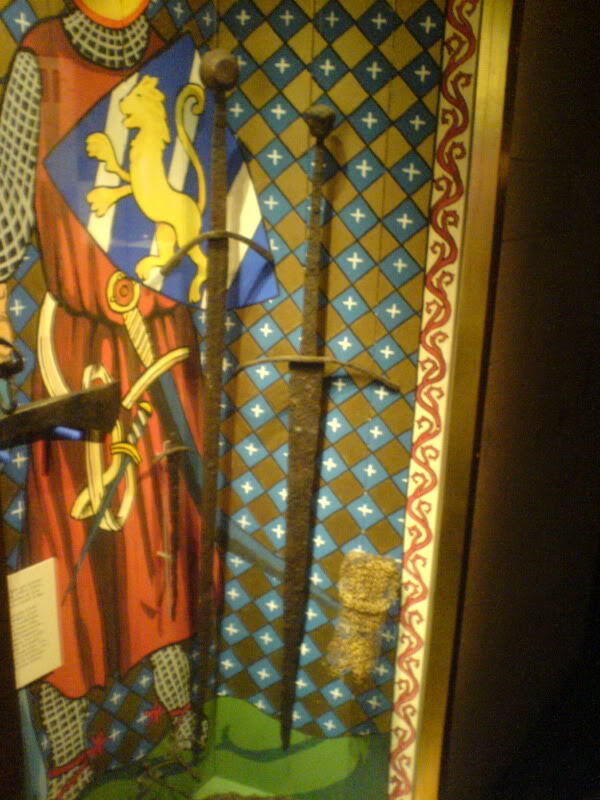 Sorry about the bad photo but this is the sword from Lund mentioned earlier. Follow this link for a bigger image. Here are three more swords from Kulturen, Lund. Note how similar the one displayed diagonally in the first picture is to Seans first picture in the top of the thread. And another big one, very similar to the ones linked by Olov. Eric: Those photos are so full of amazing things it's hard to know where to begin. That incredibly fat sword grip? That "love child" of a sword and ballock dagger? The wooden or ivory crosses? It's a different world! The more I see of these long-gripped swords, the more I like them. I can see why some folks would find them ugly, but I can imagine that a finely-made one, with bright furniture, could be very attractive. The "C" shaped ribbon cross could be especially nice, but I'd also love to do the dragon head finials of the more robust crosses shown above. I don't know about that grip, though. It's so very fat. And bound with wire? I would think you'd be trying to lighten the grip of such a sword, given the short blade and heavy pommel (that's assuming the pommel is solid). That's at least a 15" grip, right? That's a LOT of iron wire if the grip was fully bound. Re-reading Peter's comments, it sounds like wire binding might have been only partial, which leads me to wonder if it was primarily meant to secure the grip core, maybe covered by a leather wrap. I wonder what these things felt like....I guess I'll get a better idea about that after I've gathered the parts. Yet another interesting point: The large "C" cross photo Eric posted shows possible evidence of a chappe at the base of the grip--the little crescent-moon of leather extending downward from the wrap. That seems to be a common part of chappe construction, whether "D" shape or tubular. That appears to answer another question I had about these swords. This cross also appears to be smaller than the one Peter posted, though it has almost identical decoration. Sean, I'm sorry I don't have abetter photo of the sword with the C-shaped quillon. I'll remember it next time! I have a few nice photos from Fornsalen here in Visby but due to legal issues I'm not allowed to publish them online in any form. I'll dig into it the the museum staff next time I talk to them, I think you'll find some more interesting stuff there. Thanks, Eric! I certainly respect your responsibility to the museum.